I’m a proponent of all type of ice creams, including soy, coconut, and even goat milk-based. I’ve previously reviewed one of Luna Larry’s Coconut Bliss products (here), and this time I decided on reviewing another brand’s coconut frozen desserts that is soy free and dairy free. I’ve had real German chocolate cake, as well as Cold Stone Creamery’s ice cream of the same flavor, and enjoyed both immensely. Unintentional or not, I’ll be comparing this to those products. To be honest, the first time I tasted this frozen dessert, I was a bit disappointed with the flavor. But when I tried it again the next day, it tasted much, much better. It took a mighty effort of willpower to stop myself from eating 2/3rds of the carton in a matter of seconds. From this I deduced two possible reasons for the difference in enjoyment. The first is that I was tired, not to mention on a full stomach, so my body was rejecting the ice cream. The other reason is that maybe it took my taste buds two tries before it “got” the flavor and learned to appreciate it fully. In any case, I’ll try to sample something on two separate days before I complete my review, whenever possible. The appearance of this ice cream isn’t too appetizing, at least when compared to Cold Stone’s version (see references section below for a nice picture of the latter). The nuts are small and their color blends in with the chocolate so they don’t stand out. The coconut shavings are also few and far between, and blend into the chocolate and caramel base. However, as you gradually start to shovel spoon after spoon into your mouth (of course after letting it partially melt) your doubts start to disappear. Rich chocolate swirled with sweet caramel, coconut shavings that tickle the tongue, and crunchy pecan pieces that entertain the teeth – its all there. There is no brownie as with the Cold Stone version, but the flavor is comparable and there is approximately 200 less calories and half the sugar. If you take a deep whiff you’ll notice the coconut smell stands out, with a slight overtone of the caramel. There is little to no chocolate scent as cocoa is used in relatively small proportion compared to the coconut and caramel ingredients. This product has 180 calories in a single 85 gram serving, slightly lower than the average of equivalent milk-based creams. Its also slightly higher than some of the other flavors of So Delicious coconut milk. Sugar content is 14 grams per serving, which is typical for other coconut based frozen desserts, but quite low compared to many milk-based creams. I’m always amazed with the apparent sweetness of coconut-based products given their low sugar content. Its probably because agave syrup is commonly used, which is roughly 1.5 times sweeter than table sugar due to a high concentration of fructose. I’ve mentioned in a previous post that agave is potentially healthier than table sugar, but keep in mind that is still unproven and it may turn out that there is no difference from a nutritional point of view. There is only one gram of protein in contrast to the relatively high fiber (6 grams of fiber which is 24% DV). I believe most of this comes from the chicory root extract which is high in fiber. Vitamins and Minerals, as listed on the package, are negligible except 6% of Iron. ORGANIC COCONUT MILK (WATER, ORGANIC COCONUT CREAM), ORGANIC AGAVE SYRUP, ORGANIC DRIED COCONUT, CHICORY ROOT EXTRACT, CARAMEL SAUCE (ORGANIC TAPIOCA SYRUP, WATER, MOLASSES, PEA PROTEIN, NATURAL FLAVORS, ORGANIC COCOA BUTTER, SODIUM CITRATE, SALT, CARRAGEENAN), PECANS, COCOA (PROCESSED WITH ALKALI), CAROB BEAN GUM, GUAR GUM, NATURAL FLAVOR. Sodium citrate is used for flavor and also to regular acidity, and carob bean gum and guar gum are both used as thickeners to control texture. I’ve been seeing this in many of the products I’ve reviewed lately, but “natural flavor” is always a bad thing to me due to lack of transparency. Carageenan, a substance extracted from seaweed, is used to thicken and stabilize the dessert. While it is generally accepted by the FDA as a food additive, some experts advise against using it in infant formulas, and some scientific research had indicated there is a possibility it can promote cancer. However these results were done with tissue cultures as opposed to directly with human subjects, and they are disputed by the scientific community. I feel that the most nutritious ingredient in this dessert, by far, is the coconut itself – in the form of coconut milk and dried coconut. Though I am skeptical on those who claim coconuts are a “superfood” or one can live purely off them, there is a large number of vitamins and minerals in them: potassium, phosphorous, iron, zinc, folate, and manganese, among many others. There is also a large number of health benefits claimed, including raising good cholesterol, helping the immune system, and promoting heart health. (Check out the links I have provided in the references section for a starting point on researching coconut’s potential benefits.) I don’t think there is enough evidence to be 100% certain of many of these supposed benefits, but from the point of view that a wide variety of foods are good for health I feel it is wise to include some coconut in your (ice cream) diet. On a final note, I’d like to mention a word of caution about how much nutrition coconut actually contributes to this product. While “coconut milk” is listed first on the label, and hence highest in proportion that other ingredients, coconut milk itself consists of water and coconut cream, with water in higher proportion. From this all that we can determine is that the coconut milk is at most 50% coconut cream, possibly much less. That would actually put the amount of coconut cream used less than other ingredients, such as agave which is listed second. I picked this up at Whole Foods Market for around $4.99 on sale, whereas it usually sells for $5.99. This frozen dessert combines the potential health benefits of coconut with a reasonable amount of sugar and calories, not to mention an unforgettable flavor that makes it one of my favorite coconut-based ice creams. I've been studying Japanese for over 15 years and like to try and help others learn this difficult language. 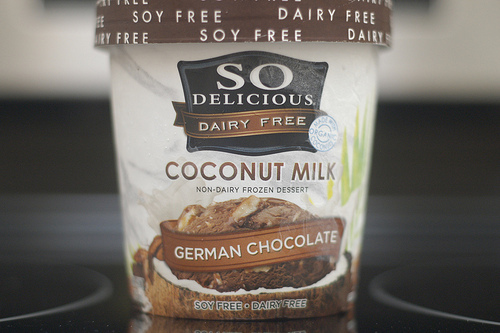 Posted on October 17, 2013, in Food and tagged "non-dairy", Coconut, coconut milk, dairy free, Food, german chocolate, Ice cream, milk free, so delicious, soy free, sugar, Sweets. Bookmark the permalink. 1 Comment.